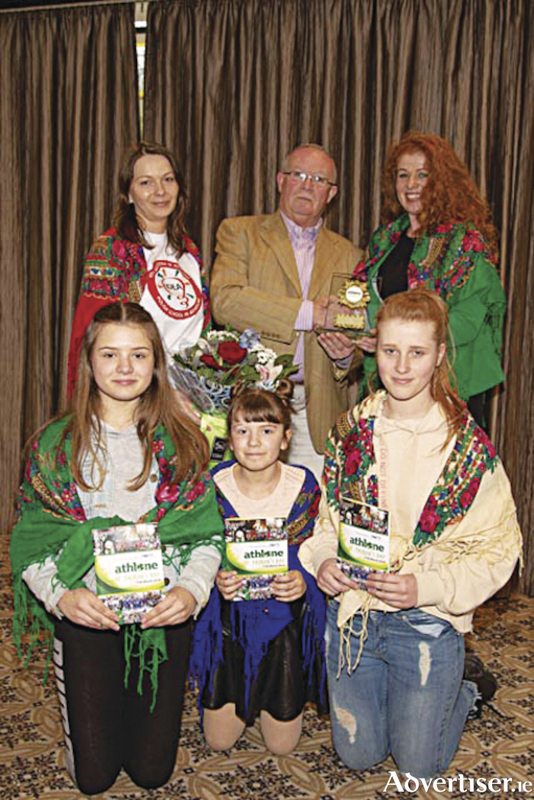 John Henson presenting an award to Polish school IDEA for Best Youth Organisation to principal Magdalena Grzeskiewicz, John Henson, teacher Kinga Kubien and students Julia Krzak, Angela Krzak, Zuzanna Kubien. Plans are already in full motion for Athlone's 2019 St Patrick’s Day parade. To kick off the event there will be a half way to Paddy’s Day American style BBQ on Friday August 10 at 6pm in the Bounty Rugby Club. Tickets are €10. This year we have decided on the theme ‘Ireland and the America Connection’, inspired by our ever growing relationship with Providence, Rhode Island. The brief history of the connection is a chance encounter between old school friends John Henson and Patrick Griffin in 2011 has led to a series of events down the years that have created a bond between Athlone and the city of Providence, Rhode Island, USA. When Patrick, who is president of the St Patrick’s Day parade committee in Providence, learned that John was retiring as commanding officer of the 54th reserve military police, he issued an invitation to march in the Providence Parade in 2012. The following year, 2013, a similar sized group of 25 with some Dublin-based Medical Corp personnel added, spent a week once again and in 2014 when the group returned to Providence for a third time, they had a large group of United Nations Veterans, mostly Athlone-based, along with them, so a huge group from Athlone marched down the streets of Providence on St. Patricks Day. Patrick Griffin has been hugely influential in forging and maintaining the bond between his former home town and his current home town. He has travelled on many occasions to Athlone and has made himself available to the St. Patricks Day Parade committee, giving some great tips and advice. In 2018, John Henson received an invitation to bring members of the newly formed military police association of Ireland to take part in the parade in Providence. A total of 32 members from all over Ireland took part and this time were joined by Caoimhe O’Connell, Athlone parade chairperson, former Mayor of Athlone, Cllr. Aengus O’Rourke and Westmeath County Council financial director Jim Dalton. Patrick Griffin has indicated that he will be travelling to Athlone for next year's parade and at the recent AGM of the Athlone St. Patrick’s Day parade committee it was passed unanimously to install Patrick Griffin as honorary grand marshal for that parade. As a result of the networking down the years we now have received expressions of interest from groups such as the national guard, police department, dancing schools, the Providence Parade committee and many more, so the American theme for the Athlone Parade in 2019 could become very authentic indeed. For more information or to buy tickets contact ‘St Patricks Day Festival Athlone’ on Facebook or call 085 2016676. At last...some rain for the soil! Page generated in 0.1056 seconds.